After testing the number of peaks my CI should be programmed at the previous day, we concluded that we would leave the programing like it orginally was, with 8 electrode peaks. For me, it didn’t really make a difference at 8 and 10 peaks, but when we tried 12 peaks, I understood less. 8 peaks also uses less battery. This week, I understood speech more, as the audiology test confirmed the day before. It still sounded robotic, and I only understand clearly if the people who were speaking were not too far away from me. I recognized most sounds. Even if things sounded a bit off, metallic, or higher-pitched, I knew what everything was. I could hear things like the car flasher, cars honking, myself typing. I could not really understand speech from the TV yet, but I knew when different people were talking. Chipmunks were gone, but things still sounded robotic. Like, some people actually sounded like R2D2. Whenever I would go near something loud, or a loud car passed by me, the hearing device seemed to not like that and would almost completely turn off. This was so annoying. 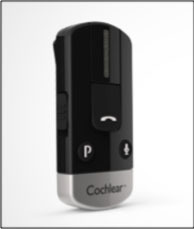 The Cochlear Nucleus 6 has a feature called Soften Loud Sounds. This allows the device to detect sounds that could be overbearing when amplified, and “softens” it by smoothing it out, and decreasing the volume. Which is nice. But it also decreases the volume on everything else, including your voice, and the voices of the people talking to you – which is not nice. So we decided to do an experiment. We added a program that does not have the Soften Hard Sound feature. The SCAN program is smart. When in use, it tries to detect the prominent sound and minimizes all background noise. I find this program very useful when in noisy restaurants. If people talk, I can hear them louder than all the clatter in the background. This program can be rigged to use the directional microphones so that it pick up all sound that’s right in front of you, or to use omni-directional microphones, in which it “scans” the place and tries to guess what you want to hear. The Nucleus 6 has telecoil, and I was happy to learn that. Those who wear hearing aids will already be familiar with the telecoil or “T” feature that allows you to hear on the phone more clearly. When you switch a hearing aid or a CI to telecoil mode, it turns off the normal microphone and this makes it easier to hear because it block off all the noice around you. It then picks up whatever is being transmitted through the telecoil – a tiny coil of wire wrapped around a core that induces an electric current in the coil – and creates a magnetic signal, which makes sound clearer. If I’m using the phone on the street and I don’t want to hear all the noisy cars, I can just switch to telecoil mode, and switch it back to the normal mic right after the call. To switch to telecoil, you can either press the telecoil button on the CI (not so easy at first), or press it on the remote. One of the three accessories that I chose. The Aqua+ is a waterproof case that allows you to use your CI underwater. The CI is not waterproof, so if you go swimming, or to a spa, the beach or just hang out anywhere where it could get splashed with water, you either need to take the CI off and not hear, or use the Aqua+. It takes some practice to assemble, and Joanie was really patient with me as I tried to put it together, take it apart and put it back on again. I will write more about this after I try to use this – I’ll probably be writing this by my pool by then. The second accessory that I chose. The mini-mic is a wireless device that allows you to stream sounds directly to your CI. It works over far distances, and even through walls! I wrote about it in this entry. For those wondering, I chose the mini-mic over the TV streamer, because if I ever want to amply the TV, that can also be done by placing the mini-mic near the TV. Apparently the mini-mic delivers clearer sound than the TV streamer. On my last visit to the CHUQ’s audiology department, we did a last audiology exam to see if I am still picking up the same soft sounds as I was able to during the last test that I described here. I could. Then it was time to learn about the last accessory that I chose: The Phone Clip. The Phone Clip is a wireless bluetooth device that you can pair with your phone and take calls or listen to audio hand-free. I can call someone, leave the phone in my purse, and talk to them through the phone clip. Their voices then go straight to my head, and I can walk around looking like a crazy person who is talking to herself. Wait – I think I do that already? You can read about the phone clip here. The audiologists and staff in the CHUQ’s cochlear implant department were all extremely patient, accommodating and very knowledgeable about CIs. They gave me so much information and there was almost no question that they could not answer. These 8 consecutive days of initial programing (only set-up!) makes Quebec’s cochlear implant facilities stand out against some others, that don’t spend as much time on programing. On the way back to Montreal, I kept making notes on what I could hear. I understood when our dear GPS said “turn right” and “turn left” but still didn’t really catch the street names. I could catch a couple of sentences on the radio, as long as they were not speaking too fast. I could even recognize some songs I knew. I could not understand all the words when people sang, but I could hear the beats and instruments and the tunes of the songs well.